Ghoulia and Spectra dolls have Kankelon hair a lot of times (a thinner, softer fiber), so I consider those the best MH dolls hair-wise. Some other dolls will sporadically have Kankelon too (Like Venus, and I think there are a couple of others), so you can do some searches to find them. I like the art style more than I thought I was going to tbh. I don't like how dominant the very cartoony style of art (with unrealistic-proportions and hardly any details, depth, or shading) has become recently. This one is a decent medium. It still lacks the detail and depth, but at least the proportions are more realistic than what is usually seen. I have to agree with Sakuya on the forced diversity. That's something that bugs me. I would rather them introduce an amazing new character rather than change the race or sexuality of a pre-existing character solely for the diversity aspect. Introductions! / Re: Why, hey there! I'm actually getting more in MH than I have been in a long time I now have all the time I need to collect all the dolls I've wanted over the years but never got. Its actually kind of fun hunting them down online for the best prices. I am also going to be ordering some large MH lots off of eBay soon because I want to start customizing and grab a ton of bait dolls before their prices go up. Right before the reboot I ditched MH and focused on my American Girl Doll collection, but I'm back, and my love for the MH brand is stronger than ever! Trader Support / To Exchange Or No? I recently purchased the Cleo and Ghoulia Exclusive (for SDCC) two pack for $40 off of Mattel.shop.com. Its part of their limited quantity 'Vault', where they sell old toys that they have leftover stock of. When it arrived today, I was kind of disappointed to find that Cleo has slight scuffing all across her top lip (and a little bit of wonk). The painting on Ghoulia's lips looks almost like it is flecking upwards rather than being a smooth line, and theres a tiny little scuff in the paint on Ghoulia's heels. These aren't super huge issues, and if these were playline dolls I wouldn't be bothered, but these are exclusive "Adult Collector" (as the box says) dolls. I don't plan to debox them, and it kind of bugs me that they came with these imperfections. The thing is though, I don't think that they will pay for the shipping if I ask for an exchange. I don't know if its worth the hassle of paying for shipping and sending the dolls back. So do I just keep these and not worry about it, or do I ask for the exchange and hope to get another set that is a bit less messy? Introductions! / Re: Hello all! Signature and SDCC Ghoulia are my holy grail dolls! Even if she's not one of your grails, I'll congratulate you anyway Also, I think she is one of the few dolls to have doll-grade kanekalon hair on certain editions along with Spectra and Venus. 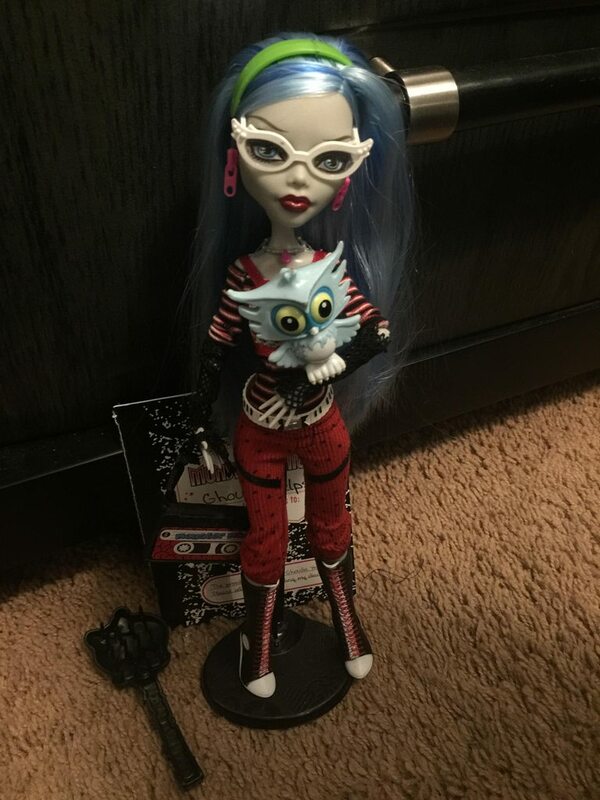 I'm not positive whether Signature Ghoulia has kanekalon hair or not, but I'm pretty sure some versions of her do, so that could be why it feels weird. Turns out there was something Monster High at Toy Fair. Skip to around 7:55 for the MH part. I think Mattel really prioritized Jurassic World and the Polly Pocket reboot this Toy Fair. I have my fingers crossed that Monster High will get at least one decent line with articulation and such.